Matthew Vona from ChemicalAnalysis.com wrote to say that they published a Quantian intro. Nice work, keep'em coming! A quick note to mention that the slides from my talk at last week's UseR! 2006 conference in Vienna are on my website. My presentation introduces and briefly discusses fifteen different ways to 'use R' in Quantian. Roughly bucketed into four categories (classic, graphical, web-based and programmatically), these approaches cover the spectrum from the well-known to newer and promising interfaces. And of course all run 'as is' directly off a self-configuring and directly bootable Quantian dvd or iso image. Once again, thanks to the organizers in Vienna who mounted yet another conference that was both fun, informative and packed with excellent talks. It also drew even more R users and developers than before -- almost twice the number of participants and presentations than in 2004. It looks like we will meet next year in Boston for a North American UseR!, followed by Munich in 2008. Based on the detailed notes by Simon Blomberg which he sent me by email, I added a reasonably detailed HOWTO on running Quantian via the VMWare Player. I had intially blogged about this here and here, but never expanded on this. The HOWTO shows how to create a virtual disk using the qemu-img command from qemu, how to add such a disk image to simple the VMWare Player configuration file, and howto install into that disk, and later boot from it, inside a VMWare Player session. All of this should actually work for just about any bootable iso with an installer, not just those that are based on Knoppix. Feedback welcome! A new release of Quantian is now available! Release 0.7.9.2, available as a iso file of 2.7 gb, contains almost 7.6 gb of quantitative, numerical or scientific software. Downloads are available via the Quantian site at the Fred Hutchinson Cancer Research Center in Seattle and at from Greg Warnes' machine at Yale. European mirrors should be in sync within a day or two, Bittorrent support via the Linux Mirror Project should also be available soon. Note that http transfers seem to be problematic due to the file size of over 2gb; rsync and bittorrent are probably a better approach. More information is as always available at the Quantian pages. A few days ago, I blogged about booting/running the Quantian iso via VMware Player, a 'free as in beer' virtualization tool. creates a 512mb file of the given name in the in required vmdb format. By the way, qemu is smart and creates a much smaller file -- an 'empty' 512mb partition occupies only 12mb. On the next reboot, Quantian will display a disk symbol for hdc. It it then a matter of starting a root shell in Quantian, running cfdisk or fdisk to partition the new "empty" disk drive and to add a /dev/hdc1 partition (or more), running mke2fs -j dev/hdc1 to add a filesystem --- and on a subsequent reboot, the disk is ready for use. It should thus be possible to create a suitable disk file of, say, ten or so gigabytes (given that Quantian expands to around seven gigs), create a filesystem and then run knx2hd to install Quantian onto the new virtual disk, make the disk bootable and, presto!, have a virtual instance of Quantian on stateful read/write media. While my tests have been limited to using a Linux host, this procedure should work just the same way in Windows. Oh, and as it's still early afternoon here: Best wishes for 2006 to everyone! Tom Short, author of Rpad, emailed me today saying that he was running the newest Quantian inside an instance of the free (as in beer) VMware Player. I tried the rpm first, but the installation needs some post-installation mojo for kernel modules, networking, etc which the alien-created deb did not provide. So take the tarball, expand it and configure the player running vmware-install.pl All defaults were sane on my Kubuntu desktop, no complaints. Tom sent me this Quantian.vmx file based on something from Damn Small Linux. It worked for me (TM) -- accept the suggested creation of a new uuid. And select the (suitably adapted) Quantian.vmx. At the bootprompt, say 'knoppix' or 'linux24' And the bootprocess should proceed. Tom reported he also needed the Knoppix cheatcode 'noscsi'. I didn't. I then tried to be cute and started two Quantian instances (which can be done if you copy the .vmx file to a new file), started both in kernel 2.4 and tried openMosix, It didn't start immediately, presumably because the test for /proc/hpc got tricked by the /proc filesystem of the non-openMosix host. A quick 'mkdir mfs; /etc/init.d/openmosix start' later, things started to roll. However, while the two machines 'saw' each other, no actual job sharing seemed to occur. They also did not 'see' the laptop running outside the hosted VMware setting even though all machines were on the same 192.168.1. subnet. Maybe a simple configuration issue, maybe not. All in all, a pleasant surprise that I was able to set all this up in a couple of minutes. Update: Fixed URL for the Quantian.vmx file. A shiny new release of Quantian is now available! Release 0.7.9.1, available as a iso file of 2.5 gb, contains almost 7 gb of quantitative, numerical or scientific software. Downloads are available from the Quantian site at the Fred Hutchinson Cancer Research Center in Seattle and at from Greg Warnes' machine at Yale. European mirrors should be in sync within a day or two, Bittorrent support via the Linux Mirror Project should also be available soon. Note that http transfers seem to be problematic due to the file size of over 2gb; rsync and bittorrent are probably a better approach. New primary mirror for Quantian! I just sent a message to the quantian-announce list formally introducing the new Quantian mirror at the Fred Hutchinson Cancer Research Center in Seattle. And there are of course the secondary mirror thanks to Greg Warnes and Yale, and the two European mirrors at the SunSites in Madrid and Aachen. My thanks to Robert Gentleman, Seth Falcon and Dirk Petersen for their help in getting the new mirror set up. Wendy from LinuxCentral.com wrote an email saying that they now sell Quantian too -- price appears to be $2.95 but they list the dvd release 0.6.9.3 as a cdrom. Update: This has now been corrected, the price at LinuxCentral.com is $9.95 for the DVD. 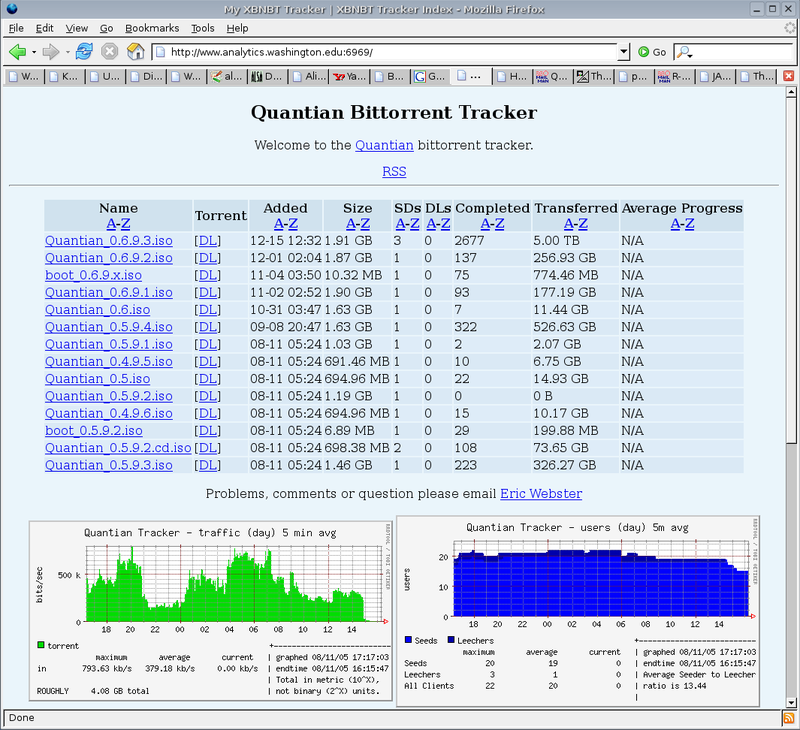 Thanks to Matt from the Linux Mirror Project, we now have a shiny new Quantian Torrent which fills the void created by opus' demise as the primary torrent server for Quantian. Still looking http, though. Suggestions welcome. Nick from frozentech.com emailed me to tell me that they also sell Quantian 0.6.9.3 DVDs -- and they get the new price record at $1.99 per DVD with $0.49 shipping. Opus, aka www.analytics.washington.edu, was shutdown last weekend as its owner, Tony Rossini, is currently on leave from U W. Thanks to Tony, and the consistent sysadmin'ing by Eric Webster, opus served as the bittorrent seeder for my Quantian distribution. As shown by this screenshot, opus had transferred a whopping 6.4 TB in total, including 5.0 TB in over 2600 downloads of the most recent release 0.6.9.3. So please join me in a big 'Thanks' to Tony, Eric and the U W for supplying this service. It is greatly appreciated. Lastly, if anybody knows of a willing and able host that could play primary or secondary mirror for Quantian as well as torrent seeder, please do not hesitate to contact me. The slides from my talk on Quantian as an environment for distributed statistical computing, given last weekend at the Directions in Statistical Computing 2005 (DSC 2005) Conference in Seattle, are now up on my site. Someone from LinCD.com was kind enough to email me: they have the current Quantian 0.6.9.3 dvd for a very reasonable $2.99, and an older cdrom release for $1.99 available with shipping rates as low as $1. A short introduction to Quantian, with Bela Tiwari as my co-author, was just published in the electronic newsletter of the Canadian Bioinformatics Help Desk (which is part of the large Genome Canada initiave). The on-line version of Wired has a story about Ian Latter and CHAOS in which he digs Quantian. Ian is the author of CHAOS (old site) which was originally put together by Ian while he was doing security work for Macquarie University in Australia. Ian is now with the IT security consulting firm PureHacking, and they have re-adopted CHAOS and are releasing new versions. CHAOS is a very small 6 mb iso distribution ideally suited for booting nodes in an openMosix cluster. Moreover, CHAOS is generally plug-in compatible with clusterKnoppix, and thus with Quantian allowing for a very powerful combination of, say, a Quantian-booted cluster head node (serving its six gigabytes of software) that can be set up with a large number of ad-hoc CHAOS (new site) drones booted of their compact six megabytes distribution. Marco Caliari has provided a new HOWTO for lilo and grub-based booting of iso images straight from the harddisk. The slightly edited file is available as part of the Quantian HOWTOs. A new release 0.6.9.3 is now available today from the usual sites at the University of Washington and at Greg Warnes' machine at Yale. Quantian made it into the tail end of a Slashdot cover story that was posted yesterday late afternoon. The following chart from my MRTG logs pretty clearly show when the story appeared, and when it fell off the front page. Cheapbytes just replied back to the quantian-general list announcing the availability of Quantian version 0.6.9.2 dvd available pre-made for $11.99 plus shipping. A good alternative for those without broadband, patience or access to a dvd burner. A new release 0.6.9.2 finished uploading earlier today. It is available from the usual sites at the University of Washington, at Debian's Alioth site. It should be available at Greg Warnes' machine at Yale once that machines becomes visible again. and numerous other package updates. More information in the Quantian changelog once I get a chance to update it, and general info is as always at the Quantian pages. Right after the Quantian 0.6.9.1 release was announced, Mark Walker wrote in to say that BudgetLinuxCDs.com now has both dvds of Quantian 0.6.9.1, 0.6 (aka the 0.5.9.4 release that finalised the 0.5.9. * test releases) as well as the previous cdrom-size release 0.5.9.2.cd. All three are accessible via this page, but make sure you pick the right version and size. Two days ago, Cheapbytes sales informed me that they have 0.6.9.1 available as well. how to boot Quantian from a USB memory device, kindly contributed by Marco Caliari. I should note that I haven't been able to boot my laptops from USB, but that may well be a limitation in these not-exactly-brandnew laptops rather than in the method per se. A new release 0.6.9.1 was uploaded to the servers at the University of Washington, at Debian's Alioth site and at Greg Warnes' machine at Yale (use this link instead while the preceding one is broken). This release is the first one based on Knoppix 3.6 and brings numerous updates -- more information is in the Quantian changelog, and general info is as always at the Quantian pages. A new release 0.5.9.4 was uploaded to the servers at the University of Washington, at Debian's Alioth site and at Greg Warnes' machine at Yale. This release may become the final 0.5.9. * release and get relabelled 0.6; work should soon commence on a Quantian based on the new Knoppix 3.6.
and made a few production fixes suggested by Marco: prepare md5sums to enable 'checkcd' option; suppress 'modules.conf newer' message by touch(1)'ing it; add new bootsplash screen; use Marco's corrected minirt24.gz and minirt36.gz boot images with ext3 patch and scsi module aic79xx. Slightly more informations are in the Quantian changelog, and general info is as always at the Quantian pages. A new release 0.5.9.3 was uploaded earlier to the server at the University of Washington. The slides from my Usenix talk on Quantian as a distributed computing environment, given earlier this afternoon, are now up. Mark Walker sent me a complimentary copy of the Quantian 0.5.9.1 dvds his company BudgetLinuxCDs.com is offering. I didn't expect that to come all the way from Boulogne Billancourt, France. Merci bien, en tout cas! A new release 0.5.9.2 has just completed uploading to the server at the University of Washington. Included for the first time are four pre-release Debian packages from Diethelm Wuertz' Rmetrics project for financial engineering and computational finance: fBasics, fSeries, fOptions, fExtremes. Other new packages include the qemu emulator as well as a variety of science packages such as kalzium, celestia, starplot, openbabel, chemtool, xtide, viewmol, achilles and blast2. Cheapbytes just emailed me saying that they have the most recent Quantian version 0.5.9.1 dvd available pre-made for $11.99, following last week's early listing of budgetlinuxcds.com who came in at $7.50. The Cheapbytes.com page also lists Mfg. Price $19.99. Being the 'manufacturer' here, I don't think I ever said anything about prices. Let alone offered to sell any. Oh well. A few people were surprised to see the most recent Quantian come in at 1.1gb, which does of course exceed the size of a cdrom. There are few good reason for this (such as the large and growing number of good packages to include, the fact that software tends to grow rather than shrink, and that we like documnentation too), and it is unlikely to change. Clean, simple, easy. Doesn't cause heatburn or pimples, and worked on my trusted Thinkpad T23, a machine from work which knows only win2k. The full writeup is now up in the new windows booting HOWTO. Mark Walker wrote in to say that BudgetLinuxCDs.com now has both dvds of Quantian 0.5.9.1 for $7.50 as well as cds of 0.5 (aka 0.4.9.6, the final 0.4. * release) for $2.50, with worldwide shipping support starting from $0.25. Kudos goes to Ed Pegg for setting this up. Thanks to Joerg Mathieu from the RWTH in Aachen, we now have another European SunSite mirror for http and ftp access to Quantian. Release 0.4.9.6 has now been `re-released' as 0.5. Not really a new release, just a new label as this version had held up well. Work on 0.5.9. * should hopefully commence in the next few days, based on Wim's recent clusterKnoppix releases derived from the new Knoppix 3.4. As always, more info at the Quantian pages. Quantian 0.4.9.6 cdroms are now also available pre-made from ulnx.com for $2.29 plus shipping. Earlier today, Cheapbytes emailed me that they now have Quantian version 0.4.9.5 available pre-made for purchase at their usual inexpensive rates. With Cebit coming next week, I'd suspect that the next Quantian release will be based on the Knoppix 3.4 that is to be released there -- but it may take a while until all clusterKnoppix and Quantian flow through. Within 24hrs of the release, Cheapbytes emailed me that they have Quantian version 0.4.9.4 available pre-made for purchase at their usual inexpensive rates. One of the side effects of having a Quantian project on Alioth is that we now have mailing lists for Quantian. If you're so inclined, you can go to the Quantian Mailing List control page for subscriptions, list archive etc pp. The new release 0.4.9.4 is now on the server at the University of Washington, and is currently being mirrored to the server at the University of Wisconsin / Madison. For the first time, this release comprises two versions: a 'kitchen sink' iso of about 950mb with everything the standard version has, plus openOffice, Scilab, Grass and a few small things. The standard release is still 700mb and fits onto a cdrom. Now based on kernel 2.4.24 (while the openMosix patch is being finalised for 2.4.25), this is still Knoppix 3.3 based. A new version based on Knoppix 3.4 will appear some time after CeBIT. As always, more info at the Quantian pages. Once again, Cheapbytes emailed me that they have Quantian version 0.4.9.3 available pre-made for purchase at their usual inexpensive rates. Still a pretty good alternative if you can't download 700mb for lack of broadband, or lack of a cd burner. The new release 0.4.9.3 was announced last night, and the Freshmeat entry has been updated. This is mostly a maintenance update with new applications, a new version based on 2.4.24 should hopefully be coming in a few days. As always, more info at the Quantian pages. Just noticed that that BSDISO, a German vendor of BSD and Linux cdrom, offers Quantian cdroms premade for EUR 3.95 plus EUR 2 for shipping. Cheapbytes just emailed me that they now have Quantian version 0.4.9.2 available pre-made for purchase at their usual inexpensive rates. This is a pretty good alternative if you can't download 700mb for lack of broadband, or lack of a cd burner. An email about the new release 0.4.9.2 just went out, and I also updated the Freshmeat entry. Lots of nice new things in it, see the changelog. There is also a known bug in the autodiscovery, see the bugs page for a workaround. Reverse googling on Quantian directed me to this offering by Edmunds which offers my Quantian live cdrom for a staggering $0.99 plus $1.50 in shipping and handling. Way to go! Someone should tell them to upgrade to 0.4.9.1, though. Cheapbytes just told me that they have 0.4.9.1 available for purchase. A first version based on Knoppix 3.3 with the updated kernel 2.4.22 and matching openMosix patch has been created a few weeks ago. This was meant as a test / convenience release for those requiring the new broadcom 4400 driver. I may not get around to making a new release for a few more weeks, so it is probably best to expose this one a little more. Thanks to the good folks at RedIRIS in Madrid, Spain, iso files for my Quantian project can now be accessed by http and ftp from a new European mirror site. As 0.3.9.3 has behaved well enough, we will simply call it 0.4. This should be the last release based on Knoppix 3.2, the next release will be based on Knoppix 3.3. This should hopefully be the last test release for 0.4. The atlas2-base-dev and pybliographer packages were installed. The localepurge package is now used to purge locale files which saves some disk space. The second test release was uploaded. It is still based on an updated but not quite officially released version of of clusterKnoppix. RPy, ipe, giac, gap-character-tables, kile, lush, felt, mpb, ent, wajig were added. We comedi as we do not have a matching kernel module for it. Getting closer to 0.4. A new version has been uploaded to Washington and Wisconsin as a first test of an upcoming 0.4 release. Based on a much newer Knoppix and the first clusterKnoppix release since the early summer, it is now based on kernel 2.4.22, an updated openMosix patch and includes a host of updated software. I also added a bunch more R-related packages. A more detailed announcement should go out tonight, probably via freshmeat. Details as always at the Quantian site. > Please double check that "PPP" (Network device section) and "Deflate > compression" (subitem of PPP) is marked as "Yes", otherwise cloop won't > compile/run. I'm trying to fix this in a later release. The files have moved at the University of Washingstin site and are now at http://www.analytics.washington.edu/downloads/quantian. They are also available via rsync, try rsync www.analytics.washington.edu::quantian for the directory listing, and e.g. rsync www.analytics.washington.edu::quantian/README.txt . for the README file. Thanks as always to Tony Rossini for the hosting space on his workstation. ... as there is still an open bug in the openMosix file system which leads to a crash as soon as files on another node are to be visited. Wim is holding off on a new clusterKnoppix until that is done. Once a new clusterKnoppix is out, I can turn to making a new Quantian release.